Tuna on Chesil!! Almost unbelievable, but true! I have been struggling recently to bring you some interesting reports, but the past few days have become hectic, with loads of exciting developments. I know quite a few of you wont believe this, and I wont blame you if you don’t but yesterday, I seen three Tuna erupt from the water not more than 50m from the shore. I was running a River Cottage Shoreline course at West Bexington. Right from the start we spotted a large shoal of Mackerel, feeding very close to the shore, which we successfully targeted. As the shoal moved down the beach a couple of the participants asked me what fin was that they could see. After a minute or so I could make out a fin that was flapping in the air and kept disappearing about every 20seconds for a few minutes. It was slowly moving down tide about 150m out. I recognised it as a Sunfish. Although I had never seen one from the shore before, I had seen plenty on my travels from a ship, when I was in the Royal Navy. During one of the periods that it disappeared we were looking in the direction that we thought it might reappear, when directly in our line of vision and no more than 50m from the shore, a large fish crashed out of the water, creating a huge splash. I was a bit stunned and didn’t get a clear look at the fish. A few seconds later another larger fish of about 50 to 60lb launched itself clear out of the water surrounded by panicked mackerel. I instantly recognised this as a Tuna. Having fished extensively abroad I had seen this exact behaviour many times. One of the group that I was with, and that was standing next to me was a South African, who was also familiar with Tuna, turned round t me and said “I didn’t know you guys had Tuna in the UK”. Just as he said that another two Tuna of similar size leaped out of the water. We both looked at each other in amazement. The water erupted with Mackerel jumping everywhere, but there was no further sightings of the Tuna. I have to be honest and say I lost most of my composure and professionalism as I rushed around frantically trying to sort out a live mackerel rig, in a vain attempt to catch one of the most powerful fish in the sea. It might have been a blessing in disguise that I didn’t hook one, as I am not sure I had enough line on my reel to contain even a 40lb Tuna. I had seen a similar sight two years ago down in Chesil Cove. This time the fish were much further out at around 250m. I mentioned it to several people who obviously thought I was mad. Two days later and a diver shot one with a spear gun. It weighed around 40lb and was reported in the press. I spoke to him later and he told me that he seen a whole shoal swim past and he just shot into the shoal and hit one. Sticking with the theme of unusual fish, I am delighted to have been proved wrong! A few days ago I mentioned that we might not see many Trigger Fish again. They were obviously listening and laughing at me, as this week I have heard of several being caught in Chesil Cove. 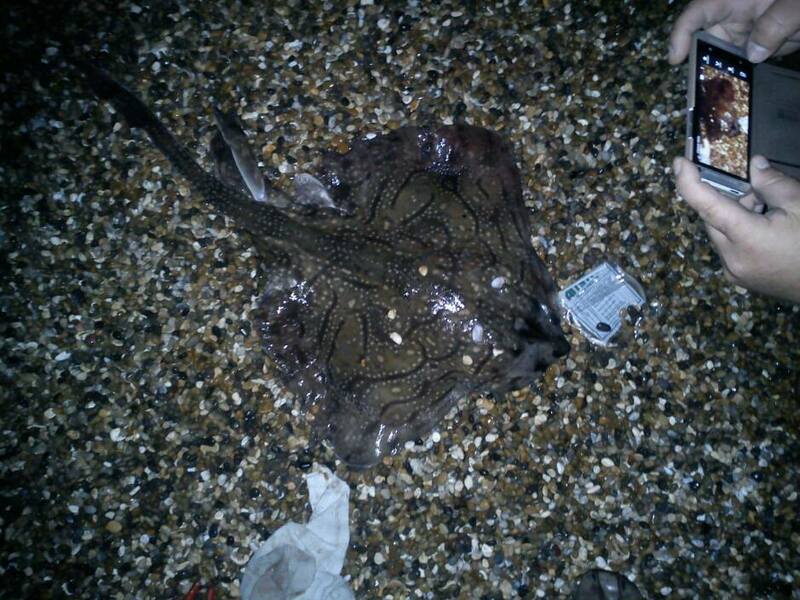 Leo from Poole also emailed me saying that quite a few had been caught at the entrance of Poole harbour. My message is still the same though, if you catch one please return it. 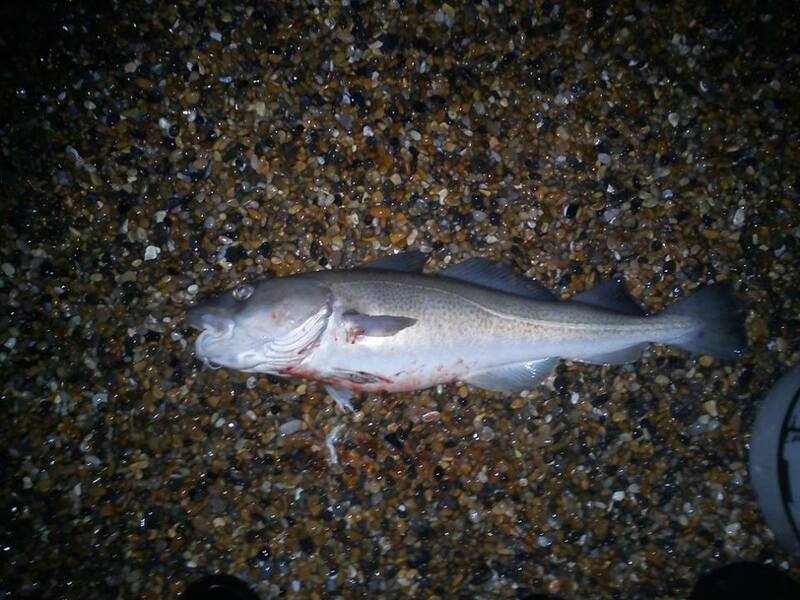 I mentioned on Monday about a number of Cod being caught from Abbotsbury, well I have some proof now as local angler Robert sent me a picture of a 5lb Codling he had, and a nice double figure Undualte from the same session. Both fish fell to Mackerel. Not bad fish but not quite as good as the huge Black Bream that took Jordan Green’s Mackerel strip. At 4lb 2oz it is the biggest Black Bream I have seen from the shore and a great contender for fish of the month. Just to add some more variety, I had an email this morning from Robert who lives in London. 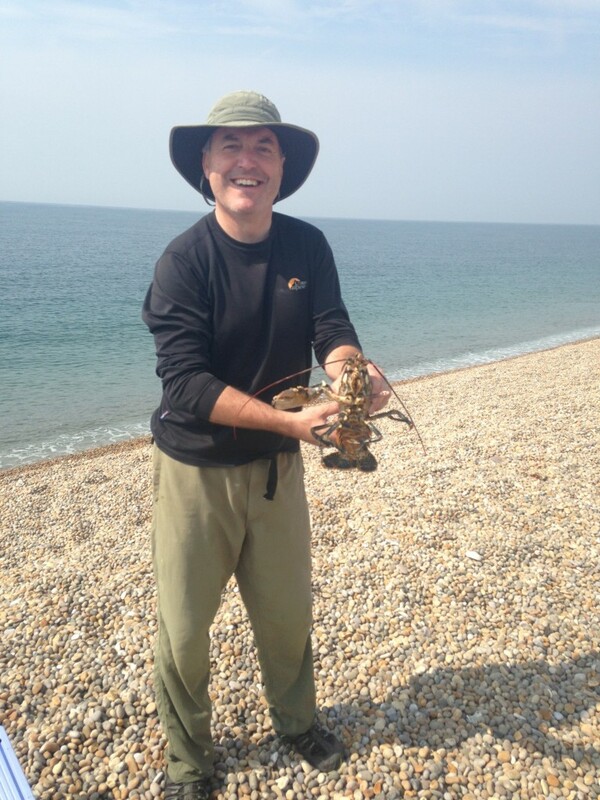 He was down fishing Chesil at the visitors centre near Ferrybridge when he managed a nice Lobster. How come that ever happens to me. Chesil Beach forecast: Given what has happened over the past couple of days, Chesil is capable of producing just about anything. It will certainly be good for plenty of Mackerel and Garfish. From the Portland end of the beach expect Bream, Gurnard, Wrasse Pollock and Trigger Fish. From the Western end of the beach towards Abbotsbury there has been some nice flatfish and with the calm conditions I would be surprised if there was not more Sole, Plaice and Dabs caught. There are plenty of nice smoothound falling to Peeler Crab. Portland: As long as you keep away from the Bill during the day, then there are plenty of mark that will produce Wrasse, Pollock, Mackerel and Garfish on lures. Night fishing with mackerel or Squid will produce Dogfish, Bull Huss and Conger. 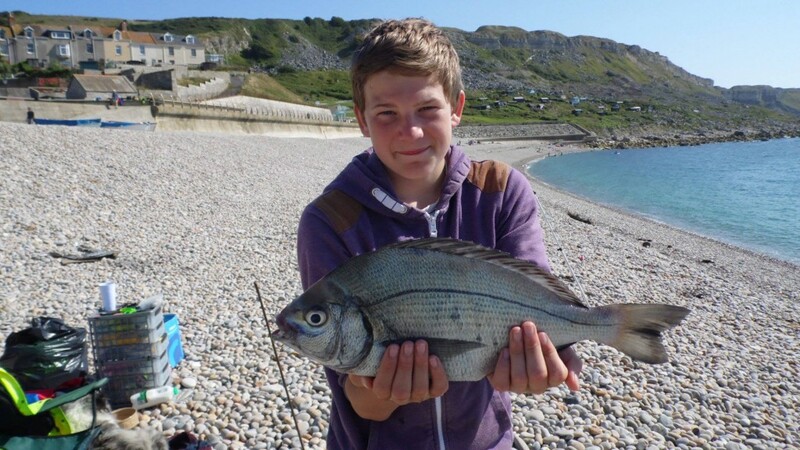 Portland Harbour: Even the harbour has started to produce Bass and Flounder again. If you want to try for Mullet the little bay opposite the Ferrybridge pub is packed with them. I saw a large fish jump from the water off Cheyne cliff last Wednesday evening. I thought It may have been a shark, but after reading this it may have well been a Tuna as there were plenty of mackerel buzzing around in the bay. Time to dust off the 50Lb Class Motor Sales special??? ?